Did your spindle fail prematurely after having it repaired? A major contributor to premature spindle failure is caused directly by the spindle repair process itself. It is important that the spindle repair facility you choose to repair your Spindle, understands and recognizes the need for maintaining exacting tolerances, attention to detail and the necessity for controlling the proper cleanliness levels for all facets of the spindle repair process. Especially critical is the prepping and Ultrasonic Cleaning of all components utilizing 3 micron “Absolute” filtration for all of the Cleaning Solvents, blowing off of parts with Compressed Air that is dried to a minimum dew point of -40 degree F and filtered with .08 Micron “Absolute Filtration” just prior to assembly. The assembly must be done in a Certified “Class 10,000 Clean Room” and when practical, in a “Certified Class 1,000 Laminar Flow Bench”. This is particularly important for “Open” bearings where they have been Grease Packed for life. If the precision “ABEC 7 or 9” bearings are exposed to dust and dirt particles that are 3 – 5 microns in size and considering the human eye with 20/20 vision can only see 40 micron size particles, you can not see the dirt that will damage your bearings. This invisible dirt is always present and can dramatically reduce the overall Service Life of a bearing and may cause premature failure of your Spindle. Even when dealing with bearings that are “Air-Oil” or “Air Oil Mist” lubricated, it is still important to keep the whole process “Clean”, as the bearings can ingest dirt and dust during handling and assembly and ultimately sustain undetected damage during the initial startup of the Spindle. The bearings won’t necessarily fail immediately, but can and will gradually deteriorate over a period of time. This is known as “McPherson’s Curve”, the chain reaction of wear. If bearings start out clean and are kept clean, providing the lubricants and the compressed air delivering the lubrication, where applicable, is “Clean and Dry”, the bearings theoretically, can last forever, unless “Crashed” or mistreated. If your spindle repair source does not have the type of facility that incorporates and “maintains” the Cleanliness levels that are absolutely imperative to the long term health of your Spindle, you should look elsewhere. You are paying for that level of service and should demand that anyone repairing your production machine Spindles comply with the cleanliness levels needed. If this process control is not embraced and adhered to, ultimately, you could receive a Spindle back from repair that will fail prematurely. How important is it to your manufacturing facility and your production schedule that your Spindles run and produce quality parts for an extended period of time? What is the cost of a “Premature” Spindle failure or “Downtime” to your business? You need to ask questions about the spindle repair process and the level of expertise for the personnel repairing your precision Spindle. 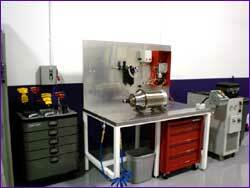 The Spindle is the “Heart” of your production machinery. 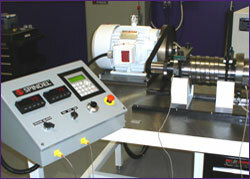 Make sure that the spindle repair facility that you Entrust your Spindle to, is worthy of that Trust. Atlanta Precision Spindle’s key people have spent years have spent years doing the right things. We have set many of the industry standards for “Clean Dry Oil and Clean Dry Compressed Air” as it relates to Spindles. We filter our cleaning solvents that process all of the various components with 3 micron absolute filtration prior to the final assembly. All of the assembly is done in a “Certified Class 10,000 Clean Room”, and whenever practical, in a “Certified Class 100 Laminar Flow Bench”. If Spindles require Air Oil or Air Oil Mist Lubrication, we use only “Purified Lube Oil” that meet or exceed an ISO Cleanliness level of 14/13/10. You can be assured that when your Spindle leaves our facility, you have not purchased a dirty uncontrolled Repair process or dirty wet lube oil or compressed air. We do it right! Our certification includes running your Spindle at its maximum rated speed and also at the speed where you historically run the Spindle. Our detailed Spectrum Analysis is performed utilizing the latest equipment and technology from Schenck-Trebel, the world leader in balancing and diagnostic testing equipment for rotating assemblies. We are continually looking for changes and advancements in Spindle testing technology, so those advancements can be passed along to you. “We want to be Partners in your success”.